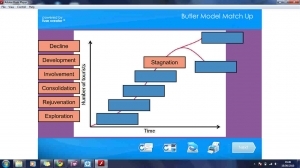 This game requires pupils to choose the correct places for the statements within the Butler Model to go. There are mark and reset buttons at the bottom to assist. In this game, pupils need to match up factors to the correct physical and human boxes. There are mark and reset buttons at the bottom to aid the task. This match up activity requires pupils to drag the correct activities to the right features required. This sword fighting question game can be played as 1 or 2 player, making it ideal to recap material as a class or in groups.